Flooded Basement? How to Stay Safe and Fix Water Damage | News and Events for Basement Systems, Inc. Does your basement look like this? 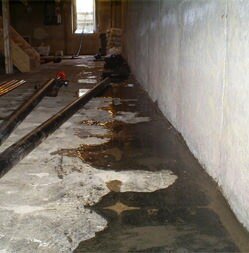 Install a basement waterproofing system to prevent flooding, water damage, and mold. When your basement floods, it can seem like a nightmare that will be impossible to clean up and restore. Not only can basement flooding cause significant damage to your possessions, it can also put the structural integrity of your home and foundation at risk due to excess moisture. Even worse, basement floods can pose a safety risk to you and your family if you try to fix the damage yourself. But don't panic! If you follow these important steps, you can safely make it through the stress and hassle of your flooded basement and prevent water damage from happening in the future. A flooded basement can be extremely dangerous, so you should avoid going down into the basement until it's been checked out by a professional basement waterproofing contractor or disaster restoration specialist. Be sure to shut off any failed plumbing, and have any standing water pumped out as soon as possible to avoid further damage. Most importantly, never touch electrical wires or fixtures, and never step into the room if these electrical appliances are in contact with the water to avoid the risk of electrocution. While we specialize in basement waterproofing here at Basement Systems, Inc., we can recommend a restoration contractor for you and will be more than happy to come in after the water has been pumped out to install our basement waterproofing system. We've seen it all, and we can locate the source of the basement flooding and prevent it from happening in the future. Plumbing leaks: anything from a broken supply hose for your washing machine, a problem with your water heater or water tank, or a burst or leaking pipe could lead to a serious basement flood. Hatchway doors and stairways: Basement hatchway entrances are usually built without being sealed to your home's foundation walls, which can allow water to seep into your basement and pool around the edges of the doors and stairways. Leaky basement windows: When your window wells fill with water, often due to flooding in your yard or a clogged gutter system, that water can leak through and around your windows and result in basement flooding. Leaky basement foundation: One of the most common causes of basement flooding is a leaky basement foundation. Basement Systems, Inc.'s waterproofing system will permanently solve this problem! Once the source of the flooding has been stopped and a professional has determined that your basement is safe, you can start to rescue your valuable possessions before the water damage grows any worse. It's also a good idea to call your insurance company if your homeowner's insurance policy covers flooding, so you can discuss your options for filing a claim and work out what needs to be done when you meet with a contractor. Now that you've dealt with the worst of the wet basement damage, it's essential to take steps to prevent basement flooding in the future and invest in any necessary flooded basement repairs. This is where Basement Systems, Inc. comes in! Our comprehensive basement waterproofing system will effectively prevent basement water damage and protect your basement from flooding, so you will never have to worry about the nightmare of basement flood recovery again. If you have drywall or wood-framed walls in your basement, it's highly likely that those walls will retain moisture and start to rot and grow mold after a basement flood. With Basement Systems, Inc.'s innovate EverLast wall restoration and basement wall products, we can replace the damaged parts of your basement walls or provide a whole new system that will stay permanently waterproof and mold-free. We also offer mold treatment, basement insulation, sump pump systems, basement dehumidifiers, drainage systems, water tank protection, and more. Any homeowner who has experienced a basement flood knows that it's never worth risking the damage and stress. If you're ready to keep your basement warm and dry for the long-term, find a Basement Systems dealer near you and schedule a free cost estimate today!